The number of thefts in residence halls has not decreased this year, even after the University pledged nearly $1 million to install electronic locks in four residence halls, including Ivory Tower, last summer. The number of thefts in residence halls has remained flat so far this year, even after the University spent about $1 million to install electronic locks in four residence halls last summer. GW police logged 88 thefts last year, up one from the previous year, according to the University crime log. An average of 91 thefts were reported in residence halls each year since 2008. University Police Chief Kevin Hay has said in the past that electronic locks help cut down on thefts in dorms because students don’t have to remember to lock their doors. Hay added Friday that the number of reported thefts in residence halls could also count incidents that occur in those buildings’ common areas or food courts – like those in Ivory Tower. The University began installing card-reading locks last summer after a spree of daytime burglaries in Ivory Tower, Fulbright Hall and JBKO Hall last spring. Many of the stolen items, which included at least 10 electronics, were taken from rooms with closed, but unlocked, doors. This year, residence halls have not been hit by similar sprees. 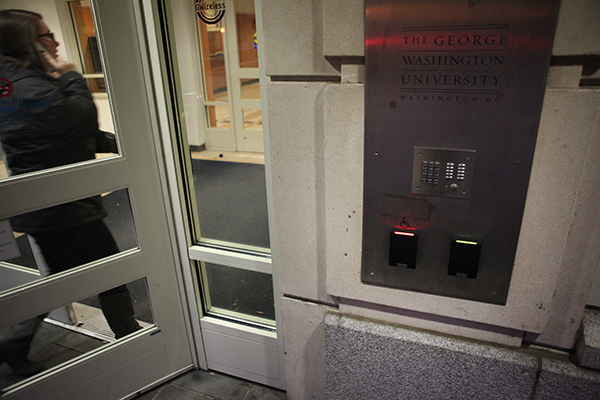 In addition to extending security guard hours at those building entrances, GW installed the keyless locks in Ivory Tower, JBKO and 1959 E Street, and made plans to add them to several Mount Vernon Campus buildings – Cole, Clark and Hensley halls – this year. The Office of Safety and Security has sent students a list of theft-prevention tips for the last several years, advising students to lock doors and report suspicious individuals seen near or in their building. Senior Associate Vice President for Safety and Security Darrell Darnell said the electronic locks, which open by way of a GWorld card, are expensive to install and maintain. The locks are used at other schools like Villanova University, the University of Virginia and Southern Methodist University. Darnell declined to comment on which residence halls could receive the electronic locks next and said University officials would “take a look at” the possibility of adding them to the 900-bed “superdorm” between H and I streets.